There’s no consistent convention for whether you translate a foreign title into English when distributing it in an English-speaking country. The rule of thumb seems to be that if it’s simple enough and sounds better in its original language, you leave it, as long as it’s easy enough for English speakers to pronounce. No one was changing Y Tu Mama Tambien to “And Your Mother Too,” for example. The most direct corollary to the new Studio Ghibli co-production is the 1970 French film Le Cercle Rouge, which is rarely written as “The Red Circle” because it just sounds banal. Similarly, Le Tortue Rouge seems like a better wait to translate the purity, the majesty, the transcendent wonder of this film than its Australian title, The Red Turtle. 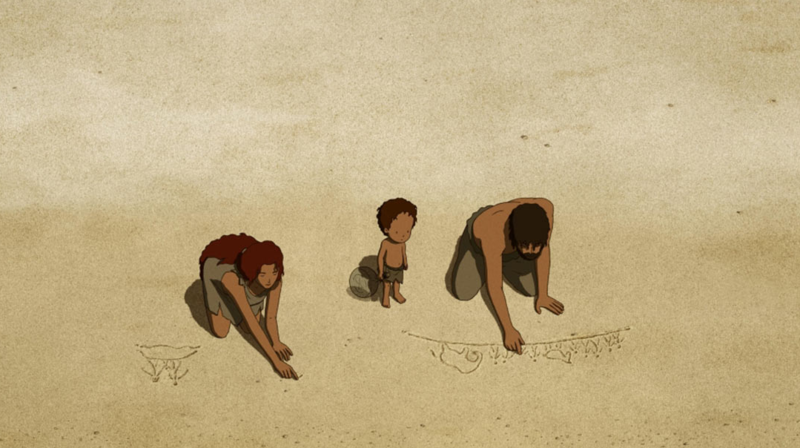 The winner of the Un Certain Regard Special Prize at Cannes this year, The Red Turtle hearkens back to our most universal and elemental of family entertainments, the ones that leave adults dumbfounded by their sheer poetic beauty. It’s immediately ready to join the ranks of something like The Red Balloon, where cinema is distilled to its fundamentals in presenting something wordless and wonderful. There’s no dialogue at all, in fact, in this story of a shipwrecked man who washes ashore on a deserted island, one resplendent with natural beauty and enough edible plants to sustain him, but one he wishes to leave nonetheless. Each attempt at building a boat and casting off into the ocean is greeted with a vigorous bump from underneath, which breaks up his craft and forces him back to shore. He eventually discovers his adversary: a sea turtle with a bright red shell. The turtle doesn’t seem interested in harming him; it just doesn’t want him to leave. The man’s relationship with the turtle develops in unexpected ways that breach the thin line between reality and fantasy, between waking and dreaming. A truly international effort, The Red Turtle is a co-production of Studio Ghibli and Wild Bunch, with France, Belgium and Japan as associated countries, and a director of Dutch-British origin. (Michael Dudok de Wit, making his feature film debut). The big name here of course is Studio Ghibli, but this film is not anime. In fact, the artwork resembles a traditional Japanese oil painting more than the Ghibli style that has become familiar to us over the past 30 years. To call it simply “gorgeous” is to understate the ways in which it is distinctive from anything else that exists in our cinematic landscape. The animation is rudimentary in a deliberate fashion, featuring line drawings against painterly backdrops, the colours muted and washed out, but gaining their own sort of earthy vibrancy. The human character has little black dots for eyes, more like the original drawings of Tintin than the saucers favoured in anime. Of course, the style owes more to the style of its director, a 2000 Oscar winner for his animated short Father and Daughter, than the works of Hiyao Miyazaki, though Miyazaki was the one who reached out to Dudok de Wit to get the project off the ground. 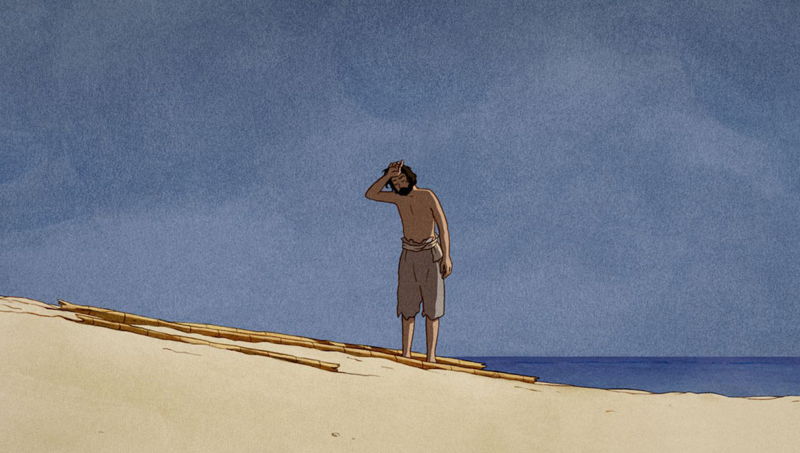 The Red Turtle is meditative, moving, plaintive and poignant. But it also has room for humour, or at least whimsy. Among the man’s island companions are a bunch of scuttling crabs, who observe his victories and setbacks with a wordless kinship, while getting in and out of his way in little bursts of movement. The man and the crabs seem to share a sense of having been plopped down in this oceanic Eden without explanation or understanding, and they exist according to the urgent principles of needing to eat and desiring social interaction. Their bond is intuitive and requires no explication. The man expresses himself through grunts and the occasional anguished howl, but the rest is wordless, making it adaptable to any audience. Body language counts for a lot in The Red Turtle. It’s a movie about the subtle yearnings that make us human, that make us crab, that make us turtle. Where the story goes is enough of a surprise that it’s not worth spoiling anything further about it. But the themes explored over the course of the narrative are primal in both a natural and spiritual way, without any of its symbolism aligning so definitively with any religious beliefs that it would drive any viewers to distraction. 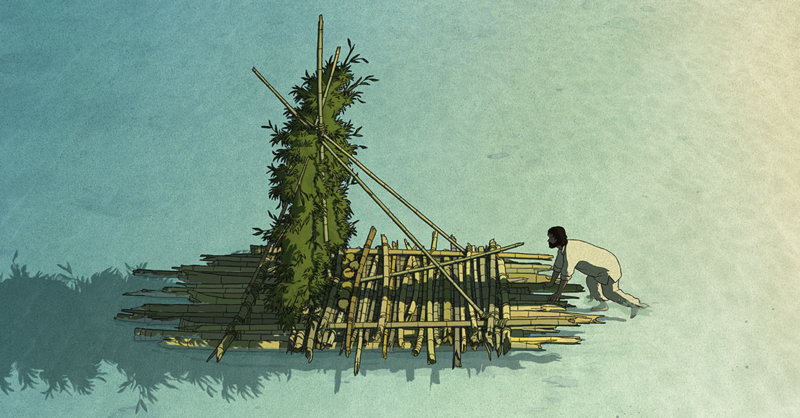 The Red Turtle is the type of contemplative experience that allows you to immerse your own experiences into it. It touches a deep and profound place in a person’s soul.